JOIN (Jurnal Online Informatika) is a scientific journal published by the Department of Informatics UIN Sunan Gunung Djati Bandung. This journal contains scientific papers from Academics, Researchers, and Practitioners about research on informatics. 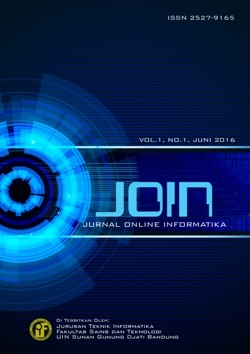 JOIN (Jurnal Online Informatika) is published twice a year in June and December. The paper is an original script and has a research base on Informatics. The scope of the paper includes several studies but is not limited to the following study.